Asturian historical heritage treasures one of the most outstanding cemeteries in Europe. It is the cemetery of La Carriona, a space designed by the architect Ricardo Marcos Bausá, located in the city of Avilés, and inaugurated in the year 1890. This Avilesian cemetery is characterized by its multiculturalism, trace of a moment in which the Indians and the merchants with South America wanted to capture the prosperity they had achieved in their respective professions. La Carriona has a central chapel surrounded by wide avenues. In them are some of the best funeral sculptures in Spain, such as the statue of the angel of the crypt of the Marchioness of San Juan de Nieva. His sculptural group is included within the European Network of Significant Cemeteries(ASCE), an association that brings together various organizations responsible for protecting those grands of great historical and artistic relevance. The great cultural value of the cemetery led to the creation in 2012 of the Interpretation Center of La Carriona Cemetery(Ciclac). 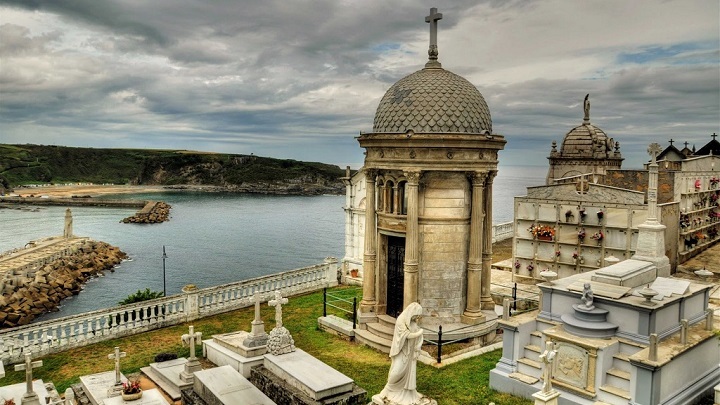 Also in Asturias is the cemetery of Luarca, located on the top of the promontory of La Atalaya, with stunning views of a maritime and mountainous landscape. In the cemetery of this parish of Valdés rest the remains of the luarqués Severo Ochoa, Nobel Prize for Medicine in 1959. In its corridors stand out numerous sculptures, and imposing pantheons dedicated to prominent characters of the town. The great necropolis of Euskadi was inaugurated in 1902, a moment in which the architects in charge of projecting the city of Bilbao, Edesio de Garamendi and Enrique de Epalza, did the same with their cemetery. Its main entrance is presided by two symmetrical arcaded galleries arranged at right angles that converge at the epicenter, where the chapel is located. Also in this entry, a large garden composed of different species such as cypresses, magnolias or cedars is particularly relevant. Like the Carriona cemetery, the Derio cemetery is a member of the Association of Significant Cemeteries of Europe(ASCE). The Cantabrian city of Castro Urdiales houses the Ballena cemetery, built in the last decade of the 19th century by architects Joaquín Rucoba and Octavio de Toledo. In its interior it is possible to find a great diversity of funerary monuments in which different architectural styles are interspersed, ranging from the neoclassical to the art deco. Another of its main attractions, apart from the stylistic variety of its sculptures, is its privileged landscape location, in which the sea takes on a leading role. All this earned him, in 1994, the qualification of Cultural Interest. 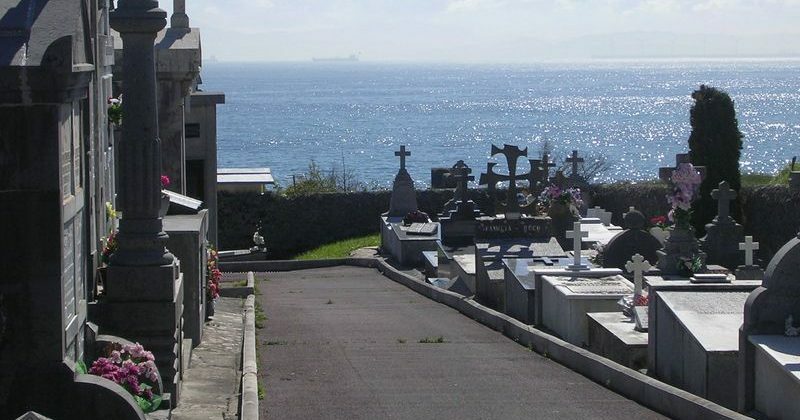 And, without leaving the maritime environment, we arrive at the cemetery of Ciriego, located in the city of Santander, and with stunning views of the Bay of Biscay. The ornamentation of its pantheons has made it one of the most beautiful cemeteries in Spain. Its main difference with respect to others is its technological advances, as it has an application with which visitors can complement their tours by inquiring about their most emblematic areas. The application also allows viewing the monuments of the cemetery in 3D. One of the most beautiful cemeteries in Spain, that of Lugo, receives the name of the patron saint of the city. The San Froilán cemetery was built in 1948. Of its old funerary constructions stands out the one that presides over its entrance: a Neo-Gothic mausoleum from the second half of the 19th century designed by the Lucero architect Cobreros, and part of the city’s heritage. city ​​in 2012. His mixture of different styles, reminiscent of the Corinthian decoration, led him to be qualified as 2015 the Best Funerary Monument in Spain. In the town of Cambados, Pontevedra, is the Santa Mariña Dozo cemetery, declared a Site of Cultural and Tourist Interest. The cemetery is located before the ruins of the Gothic church of the same name, declared a historical-artistic monument in 1943. This necropolis was defined by the Lugo writer Álvaro Cunqueiro as “the most melancholic in the world”. These two Galician cemeteries are included in the European Singular Cemeteries Route.